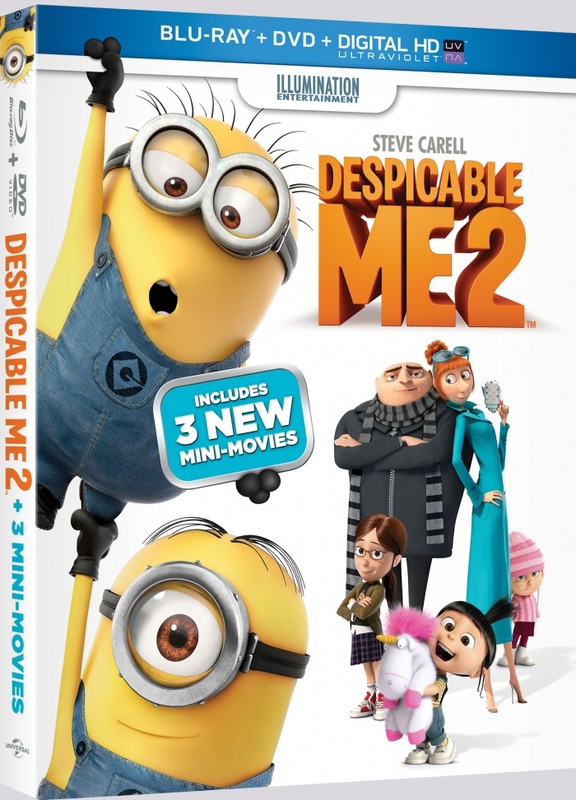 Blu-ray Review: "Despicable Me 2"
When the first Despicable Me came out in 2010, I never expected to like it. “Just what the world needs,” I thought, “another story about a criminal whose cold heart melts thanks to some cute kids.” But I did like it, a lot, primarily because of the performances of Steve Carell as super villain Gru, Jason Segel at his goofy best as Gru’s nemesis, Vector, and Russell Brand as Gru’s right hand man, Dr. Nefarious. The kids, lead by iCarly’s Miranda Cosgrove, were cute and all, but Gru’s journey made the film work. Carell’s back in Despicable Me 2, as are the girls (the other two actresses are Dana Gaier and the adorable Elsie Kate Fisher). Jason Segel’s gone and Brand is relegated to a diminished role. Benjamin Bratt plays Gru’s supposed new rival, but even he’s playing second fiddle to Kristin Wiig in the role of Lucy Wild, a secret agent of the Anti-Villain League. They recruit the reformed Gru to work on the side of good, and honestly, a good Gru isn’t nearly as fun as a bad Gru. Sure, he’s still inventing crazy gadgets and tripping all over himself, but in this sequel, Gru doesn’t go through the same character arc as he did in the first, making this movie rather predictable. We’re supposed to care because Gru is missing a woman in his life (other than his grumpy old mama, who doesn’t appear until the final frames and without the voice of the legendary Julie Andrews-boo) and that Lucy is his soul mate. It’s obvious from the moment they meet that Lucy and Gru are going to end up in love. And, like any romantic comedy, they go through a series of goofy trials before they finally fall into each others’ arms. Unfortunately, we have to sit through 90 minutes of Kristin Wiig hamming it up before we get to that moment. I’ve always had mixed feelings about Wiig. Some critics showered her with praise when she was a star on Saturday Night Live. While she’s definitely a comic force, I sometimes felt that she was a wee bit of a camera hog and overdoing it. I loved Wiig in Bridesmaids, in which she showed considerable range, but nuance is difficult to pull off in voiceover work and in Despicable Me 2 Wiig too often resorts to the over-the-top zaniness she became known for on SNL. Wiig’s shtick must work for kids, though; Despicable Me 2 was a huge hit. But for this parent who’s sat through the film four times, what she does gets old fast. If you have younger kids, they’ll probably love Despicable Me 2, especially since Gru’s kooky sidekicks, the Minions, get so much screen time. It’s not a bad movie, but it’s not wholly original, either. That originality is what made the first film so beloved in our household and millions around the world. Will there be a Despicable Me 3? I guess that will depend on how well the Minions movie does when it’s released in 2015 (yes, they’re getting their own film). If the funny short films included on the Blu-ray are any indication, the diminutive little yellow creatures can hold their own.